At the International Search Summit events, I often talk about the global search engines – looking at their latest developments and how that can guide our own international search marketing efforts and strategies. The session covers search, social, mobile and local but increasingly it also touches on content marketing – and there are some quite good examples of search engine activities which are purely content driven, designed to engage with and appeal to the target audience. I wanted to share a couple of examples here to show the kind of thing they are doing and hopefully inspire you to do the same! Chinese New Year is the most important festival in the China’s calendar. The country has a national holiday for about a week and people travel far and wide to spend time with family and celebrate the turning of the year. 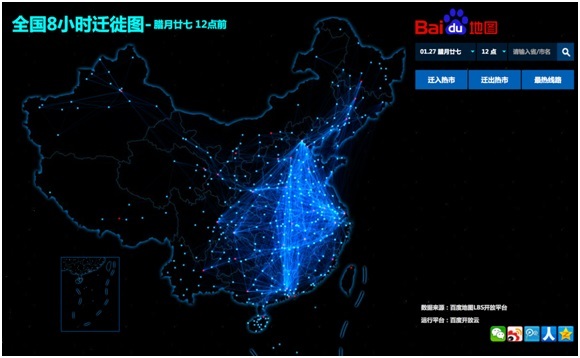 To mark this occasion, Baidu created a visualisation map, using its location data from Baidu Maps and other apps that use positioning data, to show the migration of the Chinese population in real-time over this period. Many people tend to leave the major cities and head to more rural areas, and the map details this migration providing an overview of where people are spending this significant festival. 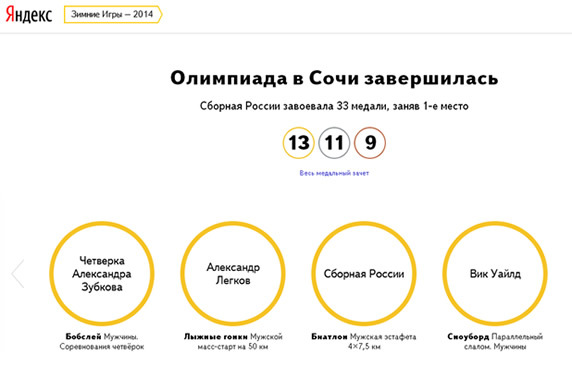 When the Winter Olympics came to Sochi in Russia earlier this year, Yandex decided to tap into the interest in and excitement surrounding the games by creating a project specifically designed to give people information about what was happening each day. It included suggestions on the main contenders in different events, insights into the different sports and of course the results, displaying a running total of Russia’s gold, silver and bronze medal tally. As many of the events took place during the daytime, Yandex was hoping to help more people feel part of the Games and catch the spirit of the Olympics, whether they are regular sports fans or not. As mapping and photographic technology improves, we are being exposed to more and more high quality images of far-flung, exotic destinations that we might not otherwise get to visit. Most recently, Yandex added some panoramic images of Franz Joseph Land in the Arctic Ocean to its Maps – after the maps content provider joined a national geographic expedition to the area. 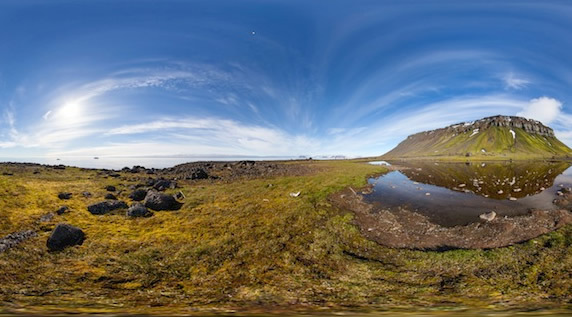 In total, 255 panoramic images allow users to navigate around the area and witness the variety and beauty of the remote land. Google has done similar things with its maps in the past – showing images from Antarctica and also taking street view into the ocean to capture incredible images of marine life. Both Bing and Google utilise their valuable home page real estate to share relevant, up-to-date content. Bing changes the image on its homepage on a daily, presenting striking images and sharing information with the user about the place, idea, object that is featured. Today’s image is Cathedral Quarry in the Lake District. And we’re all familiar with the Google Doodle – currently reflecting the World Cup – which celebrates a different event or milestone every day. This content varies quite a bit, but what it does have in common, is that it doesn’t, directly make any money for the search engine. There is no charge to users to view the content, nor are they actively directed to paid adverts or to make a purchase of any kind. By creating this content, which is relevant, interesting and/or unique, they will attract attention from existing and potential users, have their content and name shared around the web – and the world – and increase awareness and interest in what they can offer. Of course, content marketing is something that we all know is important but I, personally, find it encouraging that the search engines – those entities that we work so hard to please – are actually doing the same thing they want us to do – and that they also see the value in providing quality content that doesn’t always have an immediate and direct agenda or result. Particularly in the example of Baidu and Yandex above, they are really tapping into the things that matter to the local audience they are serving and producing something which they know will resonate with those they want to reach. (So start planning your Chinese New Year campaigns now!). When it comes to international content creation, this is really is the key – from popular events or festivals to en trend celebrities, from burning current affairs issues to aspirations and dreams, get under the skin of what interests your audience – and then let your imagination run wild! Just make sure you do your research and understand the full context and meaning of your chosen topic – or you could end up with a content fail rather than success!